Ssshh. Hear that sound? 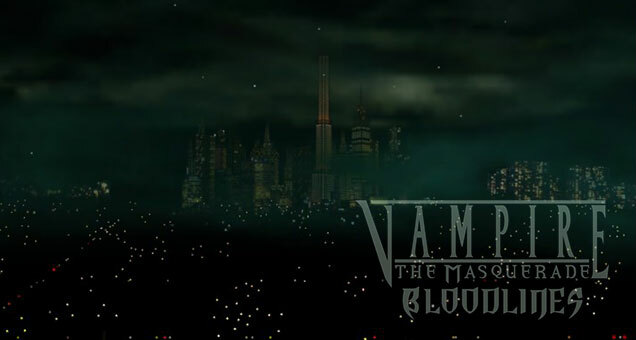 It’s the clatter of a hundred hard drives belonging to all the people who felt compelled to reinstall Vampire – The Masquerade: Bloodlines merely because I mentioned it. It’s a bit like Deus Ex in that way, in fact — only with vampires, prostitutes and dark humor. What’s not to like? Many eons ago, back when people rode iguanodons to work and the Earth was flat, I reviewed this game. For the uninitiated (or too young — I can’t believe I have to say that now), Bloodlines is a role-playing game released on the PC in 2004 alongside Half-Life 2. At the time I wrote my 2006 review, I was discussing my second attempt at the game. I say “attempt” rather than “playthrough” because I had never finished it the first time. Spoilers: I didn’t finish it the second time, either. To this day, in fact, I’ve never completed Bloodlines. Mostly because the damn thing just didn’t work. I won’t bore you with the details, but there was a bit of “development hell” behind Bloodlines’ creation, which resulted in the developer rushing the game out the door to meet a contractual deadline, and then promptly going out of business mere weeks later. Despite being a buggy mess that got buggier the further you progressed through the campaign, Bloodlines is actually an amazingly good game. It’s so good that it hurts, because when you eventually find your progress set back days (or halted entirely) because of a fatal bug, it’s enough to make you pine for the time you spent playing it long after you’ve shelved it out of sheer resignation. And that’s what I did — twice. But here I am again, eight whole years after my last attempt, playing this game yet again. What prompted my return to the World of Darkness? Two things, in fact, which combined at just the right time to create the perfect opportunity. The night we returned from a recent trip to Florida, I was jonesing for some gaming entertainment and fired up Steam. I was surprised to see that Bloodlines was not only being offered for sale there, but was on sale — for a mere $5. Since that is my “impulse buy” threshold for PC games and I did not feel like digging for my ten year old CD-ROM of the thing, I clicked through. As I was about to add it to my cart, I saw in the game’s news feed that a community patch versioned 9.0 had just been released. And that’s when I discovered what this game’s cult following has been doing for the last eight years. In short, they’ve been fixing everything the developer broke (and subsequently failed to fix before they went broke). But beyond that, they’ve been restoring missing content and even adding all-new missions, improvements and tweaks. It doesn’t change the game into something unfamiliar, it just refines an already-wonderful experience to make it that much more polished, realistic, and fun. Chief among the improvements, of course, is the ability to run the game natively on a 64-bit Windows 8 installation in the year 2014 without crashes, something nigh impossible to achieve without the community patch. If you’re interested in following me down the rabbit hole for a look at this decade-old game through fresh lenses, you can download the Bloodlines community patch here and jump right in. I’ve almost caught up to where I last left the game back in 2006, and I’ve had an amazing time doing it. Almost every night since I re-bought the game on Steam, I’ve played for at least an hour, soaking up all of the atmosphere, the excellent conversations and the addictive character upgrade system. As per my usual, I’m scouring every hub for every last sidequest available, some of which are entirely new to the community patch edition of the game. 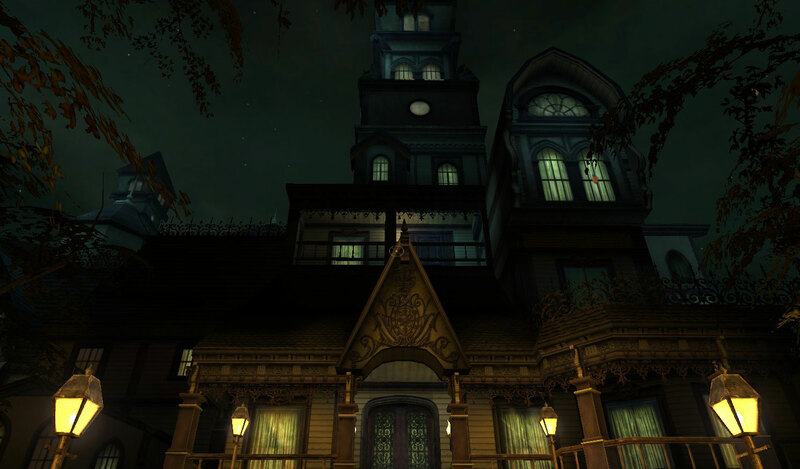 And I’ve greatly enjoyed revisiting some of my favorite level designs in PC game history, specifically the Grand Ocean House Hotel and Dr. Aleister Grout’s twisted mansion. This time through, I’m noticing a lot of little things I hadn’t noticed before. In particular, I’ve recognized a fair number of voice actors from other games of the era. Dr. Grout, for instance, is voiced by the man I refer to as “UAC guy.” That’s because the same guy (J. Grant Albrecht, for the record) did all of the voiceover for the UAC demo videos in Doom 3. And the flesh-eating Pisha, who lives in the basement of an abandoned hospital, is voiced by none other than Mary Elizabeth McGlynn of Silent Hill fame! Is it Grout’s mansion, or the box cover of The Legacy: Realm of Terror? I have accepted the role of Primogen for clan Malkavian, the dreadfully winsome label applied to the particular strain of vampirism I suffer. So named for some supposed vampire father figure of old. More poppycock grown from a backwood culture that seems interminably drawn to children’s tales and the fiction of Victorian romance when it should concern itself with the science behind their suffering. No matter, for I have taken this office for no greater reason than the advancement of my research. I must make mention, however, that even among my would-be peers in this governing body of vampires, the level of paranoia and superstition is frightening! Their intelligence is not the question; no, indeed, as they courted me for this appointment, I had to suspect that their overtures were hand-tailored for what must be my obvious infatuation with reason, for the devil would do well to have such honey-tongued tempters. Even so, I could not help but notice the dressing of language these vampire leaders chose for their ‘siren song’. Whether it is born of habit, from addressing their unwashed, ill-educated subjects or from their own deep-seated beliefs, their linguistic flourishes belie a faith in superstition over the providence of empirical reason that must be an all-pervasive theme in this society of darkest night. …Damn it all; now I’m doing it, too. Another thing I noticed is that while the game seems to have a fairly varied selection of background music to choose from, it likes to play “Disturbed and Twisted” a whole hell of a lot. But this is absolutely fine with me, because I love this piece of score. It’s among my favorite creepy BGM bits — filled with skittish pianos, sound bites played backwards, and creepy reverbed electronic hoo-ha. I could listen to it on endless repeat for hours, and I’ve pretty much done exactly that this past couple of weeks, thanks to all the Vampire I’ve played. When I brought this game up to a friend at work who I know to be a PC gamer, I found him to be an enthusiastic fellow member of its cult following. Of course, the first question he asked was which vampire clan I chose for my character. My first attempt at the game was played as a Malkavian, the clan whose every last member is incurably insane. I don’t remember anything about that playthrough, but I do remember playing as a Tremere the second time around. By the time my friend asked, I had gotten to the second hub as a Toreador. But we promptly delved into a discussion about how entertaining it was to play as a Malkavian, so that night I went home and…started over as a Malkavian. And yes, it’s so much damn fun. I mean…you can have conversations with stop signs! What’s not to love? There is, however, one bad thing about Bloodlines. It’s something I even mentioned in my 2006 review: as you get further into the game, the level design begins to get lazier and more rushed. I’m already starting to see it, a little bit. Could that museum level be any less inspired? Other than the fairly attractive central exhibit area, the rest of the level was straight out of the Wolfenstein 3-D playbook. Incredibly drab, especially after coming nearly directly from Grout’s eclectic and creepy-as-hell mansion level. I was pleased as ever, of course, to be reunited with my unhealthily-obsessed ghoul, Heather. I don’t remember her riding my coattails around to such a ludicrous degree, but there she was, dropping out of school to “watch over me”, giving me her money, locking strange men in the bathroom so I could feed on them later…and of course, wearing her traditional next-to-nothing. “Play with me?” she said once, just like that, when I came home and went to speak with her. I just about laughed out loud the one time she almost broke into song (“What is this I feel? It’s loooooooooooove!”). What a nutjob. By the way, did you know Heather’s voice actress looks almost exactly like her character in the game? It’s true. This time I hope to actually get all the way through this accursed game without giving up. I suspect that, thanks to the wonderful community patch, “progress-halting bugs” will no longer be a valid excuse. Not that I think I’ll need one. As games go, this one is definitely a genuine classic — brought forward to the modern age with more love and care than it ever saw before release. Once again, advantage: PC gaming. Join us next time when I dementate my readers into believing that I’m their pet turtle, Shelly. Only on Oddball Update: The Place For Kids Nuts.